Connecting Ontario physicians to provincial resources is a struggle, says the CEO of the Ontario Telemedicine Network (OTN), which is why OTN is partnering up with OntarioMD. 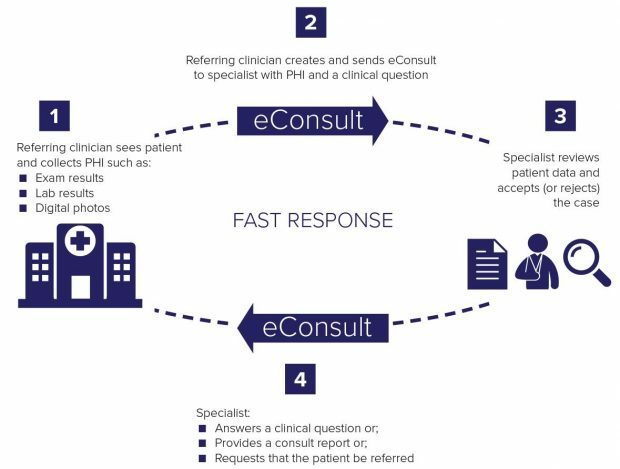 The eConsult platform. Photo submitted. The partnership, announced yesterday, will simplify the delivery of digital health services Ontario physicians use to help their patients, according to OntarioMD. These digital health services include OTN’s eConsult and eVisit Primary Care programs, pilots that connect patients with their general practitioner through secure messaging, audio and video. OntarioMD says it will also collaborate with OTN to combine its Health Report Manager, a platform that lets physicians securely receive patient reports electronically from participating hospitals and specialty clinics, with eConsult. Current response times for clinical requests through OntarioMD is, on average, two days, according to the organization. Sarah Hutchinson, CEO of OntarioMD, said it’s all about making physicians more efficient. “OntarioMD is working with OTN and other provincial delivery partners to streamline digital health delivery by combining privacy, legal agreements, compensation administration, reporting, onboarding and training so that physician practices are more efficient and physicians can focus on patients,” she said. More than 15,000 clinicians are participating in OntarioMD services, according to its website.